I have been thinking about this quote every since I watched this documentary. It has made me realize that I need to stop being afraid of my dreams. Afraid of how big they are. Because what matters is just that I dream them. Whether I ever achieve these things, that is irrelevant. We bring our dreams to life just by believing in their beauty. Just by surrendering to them. There is power in our visions beyond just ourselves, because the more of us that are willing to dream crazy dreams, the more our world will change. If you have a crazy dream, please share it with me in the comments. I would love to hear about it! Maybe we can all support each other in our dreaming. Right now I am moving on to my next project, which is writing and illustrating a children's book. Yikes! It may be a crazy dream, but I am going to pursue it anyway. What crazy dream will you pursue? P.S. I am linking up with Texture Tuesday today. For more inspiration, follow the link! P.P.S. For a little added meaning, I used Kim's Dream texture on this image. You can see it if you look closely at the tulip petals. Beautiful work. 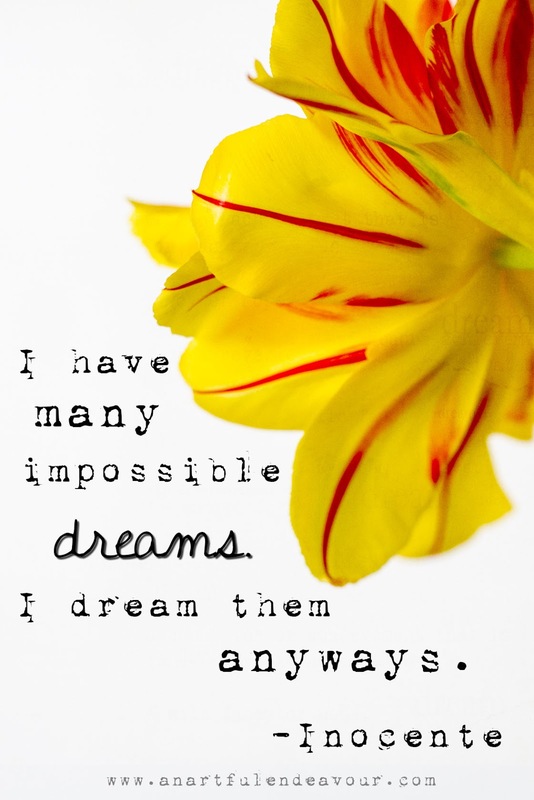 Here's t dreaming impossible dreams and I'm sure you will achieve yours! I love the bright vibrant colours here. Beautiful!